Several U.S. states are moving to help merchant nuclear plants gain increased revenue certainty to prevent early retirement. Actions in four states, New York, Iowa, Ohio, and Illinois are discussed in this Commentary. My 4 February 2015 WNN editorial (“Can Nuclear Succeed in Liberalized Power Markets?”) explained that the uncertain revenue in liberalized electricity markets makes these markets incompatible with nuclear power. Merchant nuclear plants operating in U.S. regions with a restructured electricity industry and wholesale electricity markets are facing financial stress. Some of these merchant nuclear units (i.e., Kewaunee and Vermont Yankee) were retired early and other plants are threatened. In the U.S. regions with electricity markets, state governments still regulate retail electricity suppliers. This Commentary is about four states where regulation of retail electricity suppliers is (or may be) used to provide revenue certainty to threatened merchant nuclear plants. The R.E. Ginna Nuclear Power Plant, LLC (Ginna) is a merchant nuclear power plant in New York State that sells power into the New York ISO wholesale electricity market. Ginna would retire early without additional revenue, resulting in local/regional grid reliability issues. The New York Public Service Commission (NYPSC) directed Ginna and Rochester Gas & Electric Corporation (RG&E; a regulated electricity supplier) to negotiate an arrangement to keep the Ginna nuclear power plant in operation to prevent reliability issues. The negotiations resulted in a Reliability Support Service Agreement (RSSA) between Ginna and RG&E. On February 13, 2015, RG&E filed a request that the NYPSC accept the RSSA with Ginna and approve the recovery of RSSA payments from RG&E customers. However, the RG&E recovery of RSSA costs would constitute a “major change” in rates, triggering a NYPSC requirement that the proposed rate schedule for cost recovery be suspended and that hearings be scheduled to consider the rate changes. On 24 Feb 2015, a notice was issued for a conference to establish a schedule for hearing on RG&E’s request and to identify parties and issues that will be covered in the hearing. The Duane Arnold nuclear power plant was sold to FPL (NextEra Energy) in 2005 along with a power contract that expired in Feb 2014, when the unit’s original NRC operating license was to expire. Duane Arnold received NRC approval in late 2010 to operate until Feb 2034. In 2013, the Iowa Utilities Board allowed Interstate Power & Light (IP&L) to amend and extend the long-term power contract with Duane Arnold to cover an additional period of about 12 years. The state regulator approved the contract amendment because it provided benefits. In addition to the economic impact on ratepayers, the Iowa Utilities Board considered the benefits, including local jobs, of continued operation of the Duane Arnold nuclear plant. 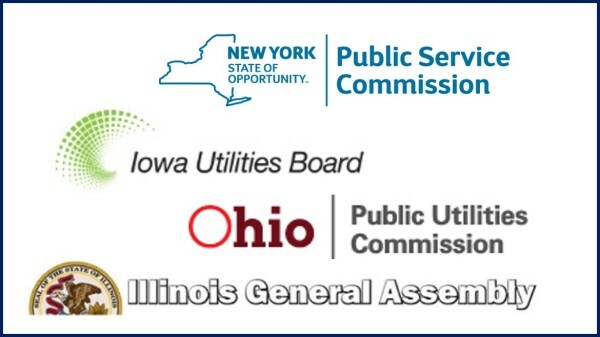 In Ohio, FirstEnergy filed an application with the Public Utilities Commission of Ohio (PUCO) to put a new long-term power contract in place between its unregulated Davis Besse nuclear subsidiary and its regulated retail electricity supplier subsidiaries. The proposed power contract is similar to a two-way hedge contract or a Contract for Differences. This contract would provide additional revenue to the Davis Besse nuclear plant when electricity market prices are low and would provide benefits to electricity consumers when electricity market prices are high. The contract costs/benefits would be applied in a non-bypassable charge/credit (called a rider in Ohio) that would apply to electricity customers. On 25 Feb 2015, the PUCO ruled against a similar proposal by a different Ohio utility for a power contract related to a coal-fired power plant. However, the PUCO decision affirmed that the proposed power contract approach between an unregulated generation subsidiary and a regulated retail electricity subsidiary is legal and may be approved if the power contracts provide benefits to retail electricity customers. The proposed power contract for the Davis Besse nuclear plant is under review by the PUCO, with a vote expected in April or May 2015. The Illinois legislature ordered state agencies to prepare a detailed report on threatened merchant nuclear plants. Based on the detailed report, House Bill 3293 was put forward. This proposed law would establish a new Illinois Low Carbon Portfolio Standard (LCPS). The LCPS requires Illinois regulated retail electricity suppliers to obtain low carbon energy credits to for 70% of electricity used. LCPS low carbon energy sources include wind, solar, hydro, tidal, wave, clean coal, and nuclear. LCPS costs are paid be retail electricity customers. By preventing early retirement of threatened merchant nuclear plants, the Illinois LCPS would also help the state comply with future EPA rules on carbon emissions. Illinois – lower carbon emissions, enhanced reliability, and local economic impact. All four examples show that U.S. wholesale electricity markets do not provide sufficient revenue to support continued operation of merchant nuclear power plants. These approaches provide retail electricity customers some of the benefits of long-term generation planning and vertical integration that are not provided by wholesale electricity markets. State Of New York, Public Service Commission; Case 14-E-0270 – Petition for Initiation of Proceeding to Examine Proposal for Continued Operation of R.E. Ginna Nuclear Power Plant; Order Directing Negotiation of a Reliability Support Service Agreement and Making Related Findings; Issued and Effective: November 14, 2014; page 22. State of Iowa, Department Of Commerce, Utilities Board; In Re: Interstate Power and Light Company and FPL Energy Duane Arnold, LLC; Docket Nos. SPU-2005-0015 and TF-2012-0577; Order issued January 31, 2013; page 38. Public Utilities Commission of Ohio, Opinion & Order, Case No. 13-2385-EL-SSO, 25 Feb 2015, page 25. 99TH General Assembly, State of Illinois, 2015 and 2016, HB3293, 27 Feb 2015.